Warning: I’m not an expert comic book fan. I only recently started reading comic books due to curiosity. Although I do know general history about these characters, I’m approaching this as a novice, and writing this review for other novices that want to do what I did, and get into comics now. Also, there will be spoilers. Written by Marguerite Bennett and art by a whole slew of artists and colorists (Marguerite Sauvage, Laura Braga, Stephen Mooney, Ted Naifeh, Garry Brown Bilquis Evely, Mirka Andolfo, Ming Doyle, Sandy Jarrell, M.L. Sanapo, Marc Deering, Wendy Broome, Doug Garbark, and Kelly Fitzpatrick), DC Bombshells is set in the 1940’s in the midst of Hitler’s rein in Nazi Germany. We initially follow Bat Woman, Kate Kane, who plays for the All American Girls Professional Baseball League (AAGPBL) as she uses her batting skills and perfect aim to take down adversaries. Eventually we are introduced to Captain Amanda Waller (leader of the Bombshells), Wonder Woman, Supergirl, Stargirl, Mera, Cat Woman, Zatanna, Poison Ivy, and Harley Quinn. Done in the 1940’s pinup style with a touch of dieselpunk, DC Bombshells is mainly an all female team-up with occasional male team members such as John Constantine, Lex Luthor, and Steve Trevor. 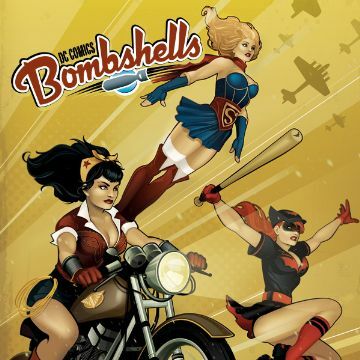 Volume 1 includes issues #1-6 of the DC Bombshells comic, released in 2015. The graphic novel format was released in 2016 to a great fanfare of merchandise, so popular, that a second set of statues are currently being developed for release later this year. To be honest, it was rather difficult to go through the book. It was certainly heavy with the fan service in both story line and art, so it’s rather questionable if males were still the target audience. In a time period where women’s equality was hitting it’s stride (women’s right to vote in the US was only ratified 13 years after Hitler came to power), the female audience, at least in this context, seemed to still be an afterthought. I did enjoy the historical references, such as the Night Witches, the AAGPBL, and Hitler’s interest in the occult, but it wasn’t enough. 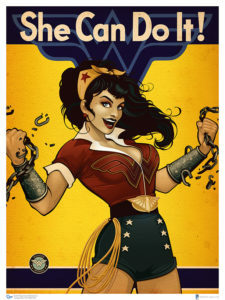 Harley Quinn’s (currently one of the more popular female characters in the DC franchise) story line is all over the place, Poison Ivy’s story is murky in this volume, Zatanna and Constantine’s involvement is also pretty muddled, with only Super Girl and Star Girl’s story line holding water, and since Wonder Woman’s arc is closely related to her origin story, it remains one of the few clear cut stories in the book. DC Bombshells artwork is definitely stunning and it’s understandable why the merchandise has become so popular, since Ant Lucia’s cover art for the series is certainly impressive. I’m hoping the second volume will give the muddled stories a bit more depth and give this mostly female team-up the cohesion it deserves. You can find “DC Bombshells: Volume 1 – Enlisted” now at your local comic book shop and book store. 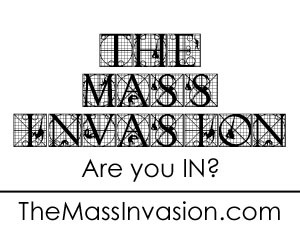 Digital and hard copies are also available through Amazon and ComiXology.